More and more colleges are creating opportunities for students, graduates, and alumni to interact, get to know one another and, when appropriate, gain career assistance. These events may be advertised with a clear career networking focus or have another social or cultural emphasis like a gallery visit, happy hour at a pub, or presentation by faculty members or prominent alumni. These programs might be sponsored by career offices, alumni offices or regional alumni groups. Check with your college's career services office, alumni affairs operation, and local alumni club for a schedule of upcoming events. Ask the event sponsors for a list of prospective participants as well as their career and employer affiliations in advance of the program. Identify alumni who are working in fields or for employers of interest and make sure that you find a way to approach them at the event. Research their field, employer, or industry to identify some trends and challenges in their sector. This will help you to ask more sophisticated questions. Prepare a List of Questions: Prepare a list of questions prior to the program. Make sure that you are genuinely interested in hearing responses or you might seem stiff or insincere. Ask your career office to share a source for examples of these types of queries. Reviewing some of the content on informational interviews will give you some ideas. Be prepared to offer some information about your interests, talents, skills, accomplishments and/or goals. It will be very hard for the assembled alumni to help you if you haven't furnished them with a sense of who you are and where you're headed. Research Career Fields of Interest: Research some career fields of interest so you can share some possible targets (it can be more than one area if you present a solid rationale for targeting each career). Even if you can't name a specific field or articulate a coherent goal, it will be important to at least share some of the skills you enjoy utilizing which have led to some successes in class, work, athletics, or co-curricular life. Practice an Elevator Speech: Practice a brief introduction or "elevator speech" which can be delivered in 20 - 30 seconds. If the event has been advertised with a career theme, then the content can focus on your career status and interests. For other events, your introduction might contain some more general information connecting you to the theme of the program, for example, "As an art history major I really enjoy modern art and was excited to hear that an alumna was exhibiting at this gallery!". It's almost always better to establish a personal rapport before asking for concrete career assistance at these programs. Be patient as you cultivate a personal connection with alumni. Look for a common basis like a shared interest, college sport, club, or faculty contact. Asking them about the most rewarding aspects of their college experience can help move things along. Arrive Early to Mingle: Arrive early so you can mingle with people as they arrive and before key contacts are crowded by others. Hang around afterward as the group thins out and some of the really motivated helpers will still be available. You might even be invited out for a post-program drink. Bring Business Cards: Bring business cards if you have one and create one if you don't. For students, your card might contain a title like "aspiring sales professional" as well as contact information and a web link to your LinkedIn profile and resume. You can also bring copies of your resume and share them as appropriate given the nature of the event and the rapport you have developed with a specific contact. If you really hit it off with an alumnus, you might ask if you could meet with them for an informational consultation or shadow them at work. Follow Up After the Event: Follow up after the event with contacts that you make. Send an email, thank them for any specific advice and include a reminder of who you are by sharing your LinkedIn page. Your follow up communication is another opportunity to take things a step further by inquiring if you might do an informational interview or job shadow. You might also ask for suggestions of other alumni contacts given your interests or for job leads if you have laid the groundwork. Remember that campus career panels with alumni and visiting alumni speakers represent opportunities for networking before and after the formal presentations. Helping to sponsor such programs on behalf of student clubs can give you the opportunity to get to know alumni better. 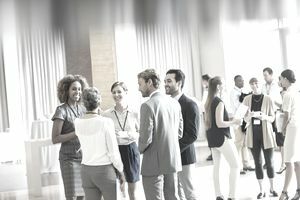 College reunions are a great way for alumni in career transition to reconnect with former classmates. Students can volunteer to help out at such events and gain access to helpful alumni. Implementing some of these strategies can help you to tap into the goodwill of alumni at your school and have a dramatic impact on the progress of your job search. Is LinkedIn Worth It or a Waste of Time?